If you like to join, you are very welcome! Please read the Rules and the Discussion, and then enter your name in one of the teams. The game has ended. /Review. Herman: Build the bottom while removing aji. kb: Resign. Any more moves, because of the slow rate of choosing moves (I am also at fault here), is just pedantic. I think a great deal of learning can come from a review *now* and not later, when those involved have moved on. Anonymous: I think some commentary on R13 is in order. In retrospect it looks like a very good move, but was it? unkx80: Strengthen the Black group. I treat and as miai. unkx80: The last big move, in the opening sense. kb: Extend - natural and thick. unkx80: Extend - build a base. Herman: Strengthen left side while leaning. unkx80: Play at the biggest area. unkx80: It's time to settle the group. ThorAvaTahr: Defend against the peep. unkx80: Continue settling the group. ThorAvaTahr: Hane at the bottom of two? unkx80: Continuation of the standard sequence. kb: Only move again. Good shape inside your opponent's influence is necessary. unkx80: Get ahead in the running fight. unkx80: Prevent the group from going home. unkx80: White ignored the shoulder hit, so we turn that White stone into an armpit hit. unkx80: Now that and has done its job, it's time to approach the upper-left corner from the left side. unkx80: Prevent White from forming sanrensei on the left side. 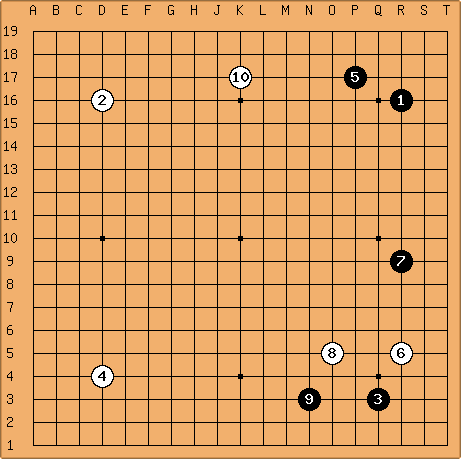 kb: Invade Black's enclosure on the right - over-extended by one space. unkx80: Prevents from making a base. unkx80: The one-space jump is never bad. kb: After , the White stones are thin and need to be settled. kb: Star point got the most votes. unkx80: Since Herman is away, I think I'll be making moves for quite a while... until he comes back or some other captain joins the team. kb: Flexible shape against a loose pincer. kb: Take a common big point.